I’m very close to publishing my next book, Flowerantha! Since it’s so different from Front Row, I’ll be publishing it under a pen name – Bek Castro. If you are interested in fantasy novels, you can get a free advanced copy if you join my mailing list between now and July 3. Why free? To (hopefully) get people excited about it! Who doesn’t love free stuff? 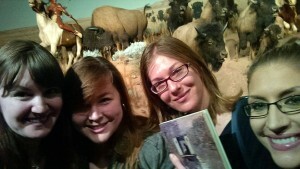 Back in March, my local writing buddies and I visited the Milwaukee Public Museum to be inspired. Laptops and notebooks in hand, we wandered through the rain forest, the Streets of Old Milwaukee, and each of the continents, stopping when we found a good bench and writing away. One of our stops was the igloo in the Arctic area. This area inspired me to write a cave scene for Flowerantha and also a scene for a hopefully forthcoming (meaning, years away) Oregon Trail story. I have a writer friend for whom history is her thing, so it’s a little intimidating going down that path. But I know she’ll have so much knowledge to share if and when I do! Anyway, I was looking for the cave scene to incorporate into Flowerantha when I stumbled upon the historical fiction one. Pardon the historical inaccuracies. Front Row is now available on iTunes, NOOK, and Smashwords! You can also sample 20% of the book before you buy it! Appreciative screams answered Braden’s question for him. “I think I’m wearing too much clothing.” Braden latched the hem of his shirt with his thumb and pulled the fabric up, revealing the perfect ridges of his eight-pack abs. Girls lost their minds all around the lido deck. Markus tried to direct the attention back on himself. “Braden just doesn’t know how to dress for this lovely weather we’re having. How do you like my shorts?” Markus’s board shorts were bright pink with musical notes, stars, and skulls scattered across them. On his head was one of his signature bandanas—this one was black with a typical western print, and a straw cowboy hat sat atop that. A tank top with large, gaping holes for the neck and arms showed off his much scrawnier physique. “Were you guys going to start the show without us?” The precocious (even at the tender age of 39) voice of Skylar blared out of the speakers, and the blond hunk sauntered out and draped his arm over Markus’s shoulder. “I see Braden’s already gotten the strip show going.” He waved at a few overly excited fans jumping up and down a few rows back. Luc and Vaughn, arguably the lesser popular members of the band, trailed Skylar and rode the wave of the screams from his fans. I just got home from the UW Writers’ Institute in Madison, and I should probably be sleeping. With my book party on Friday (check out the pictures on Facebook) and an unfortunate reaction to food Saturday night, I’m exhausted. But I’m also exhilarated from all the inspiration and support from this weekend. I missed Thursday and Friday’s sessions, which is too bad. They had a lot of good material, so maybe next year I can make a long weekend out of it. I’m going to list my five takeaways from each session I attended. People like lists. Where is the love?? Need to make the reader care. In the hook, you need to define what are the stakes, and why do we care? To the reader, every sentence is an audition for the next sentence. If have to get through writing a section just to get to a section you’re more excited about, then you need to think about changing it. You should be excited about every section. Cliché hooks include waking up from a dream, internal thoughts, and basically anything you’ve read before.